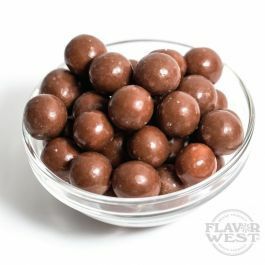 Enjoy the sweet malt candy balls flavor that delivers a craft milky chocolate taste. A drop of this flavor will cast your mind to its distinct mouth-watering taste. Type: Malt Candy Balls Water Soluble Flavoring. Ingredients: Natural Malt, Artificial Flavoring and Propylene Glycol. Flavor suitability: Cooking and baking, yogurt, cheese cake, ice cream and chocolate. Specific Gravity: 1.03 No Refunds on Flavoring.